CAIRO (AP) - Cries of "Egypt is free" rang out and fireworks lit up the sky over Cairo's Tahrir Square where hundreds of thousands danced, wept and prayed in joyful pandemonium Friday after 18 days of mass pro-democracy protests forced President Hosni Mubarak to hand over power to the military, ending three decades of authoritarian rule. The 82-year-old leader was the epitome of the implicit deal the United States was locked into in the Middle East for decades: Support for autocratic leaders in return for their guarantee of stability, a bulwark against Islamic militants and peace - or at least an effort at peace - with Israel. The United States at times seemed overwhelmed throughout the 18 days of upheaval, fumbling to juggle its advocacy of democracy and the right to protest, its loyalty to longtime ally Mubarak and its fears the fundamentalist Muslim Brotherhood - or more radical groups - could gain a foothold. His fall came 32 years to the day after the collapse of the shah's government in Iran - the prime example of a revolution that turned to Islamic militancy. About 300 people were killed in the course of the turmoil. 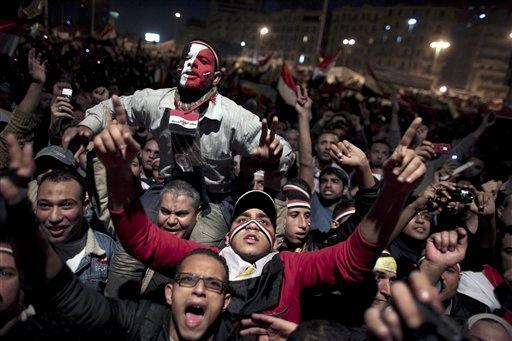 Police attacked the first protests with water cannons and gunfire and then a force of regime supporters -believed to be paid thugs - assaulted Tahrir trying to dislodge the protesters, only to be beaten back in two days of pitched battles.